No weighty problems with this Japanese inspired salad! OK I got a confession to make - my family and I just love going for tea at Delicious at the Ms Read boutique, One Utama. 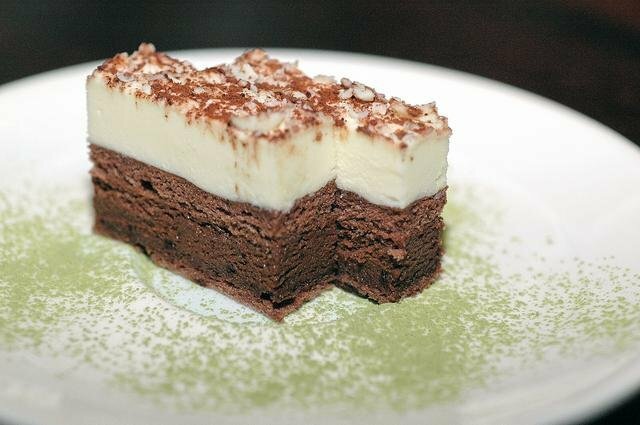 Long before I was invited for the latest review, we just love their chocolate cake, angel hair pasta and coffees. So how did their latest dinner menu rate? Well, I'm biased so I'd say its 89% good! Modelled after trendy bistros overseas (especially Oz we reckon), Delicious does not confine itself to any particular cuisine. Available from 6 pm onwards, the new dinner menu comprises four entrées, four mains and four desserts, with enough variety to please the different generations in any Malaysian family. The prawn bisque (RM11.90), a light creamy soup with diced prawn and coriander is a good example. 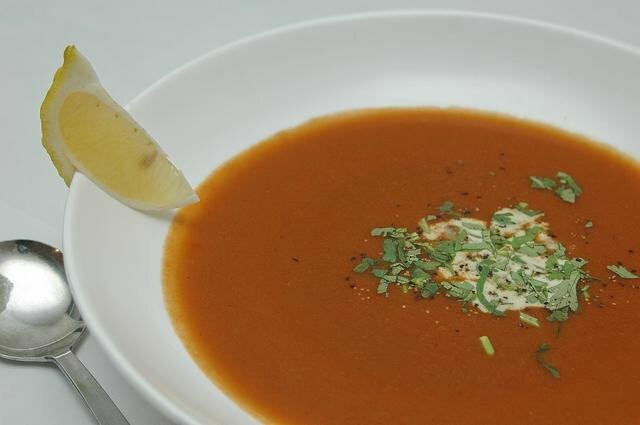 The soup’s earthy and rustic nuances will easily appeal to the tastebuds of both young and old. In fact, we thought it comparable to a rich lobster bisque. 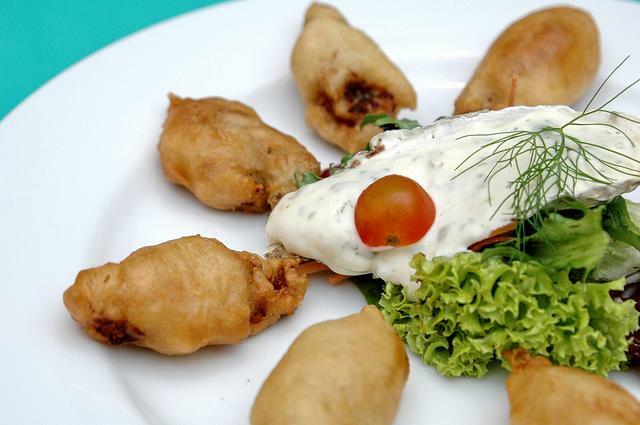 Another guaranteed crowd pleaser is the salt and pepper squid (RM13.90). Tossed in five-spice seasoning before they are lightly pan-fried, the calamari rings are tasty bites that went perfectly with its tangy and mildly spicy Thai-style chilli dip that was separately served on the side. Weight-watchers will find the miso tofu salad (RM13.90) a godsend. 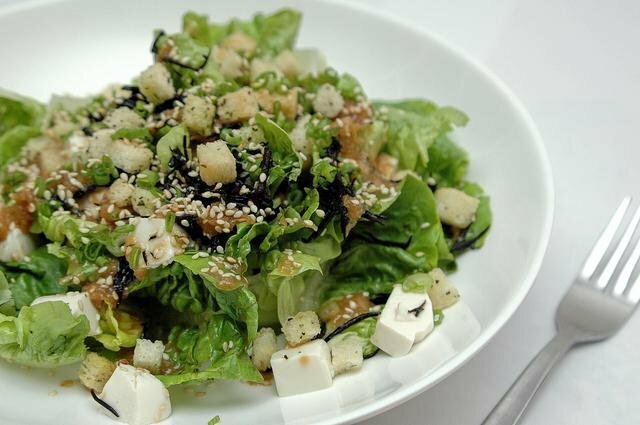 The simple, wholesome and tasty combination of butter lettuce, cold beancurd dices, wakame (Japanese seaweed), grated radish and sesame seeds tossed in a piquant vinaigrette of shoyu and wasabi-based dressing is just ingenius! Somehow the slow-cooked lamb shank ravioli (RM16.90) failed to excite although the gently poached hand-made ravioli were stuffed with tender pieces of braised lamb shank. But I do like the arugula or rocket salad drizzled with a tangy balsamic reduction atop this ensemble. The main course of grilled miso cod (RM29.90) on a bed of marinated cold soba and long strips of crunchy cucumber deserves top billing. 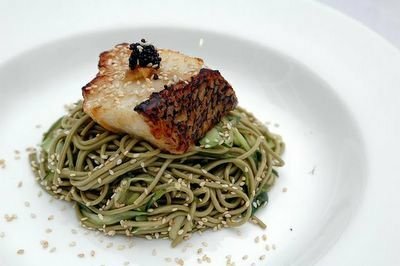 Imagine the soft, buttery texture of grilled cod imbued with the delicate nuance of Japanese bean paste melding perfectly with the crisp, clear flavours of green tea soba noodles. 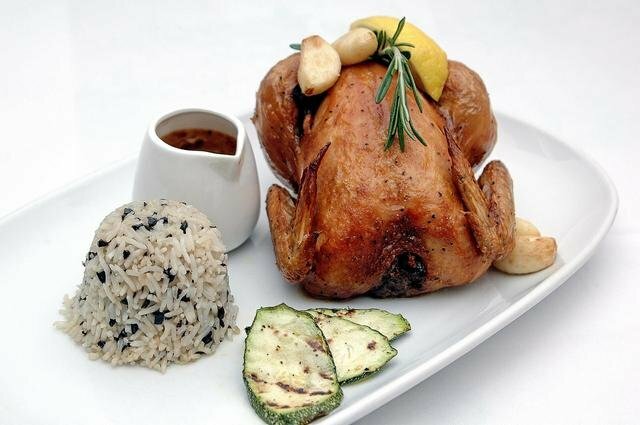 I love the pared-down presentation of its roasted spring chicken (RM28.90), akin to a miniature Christmas turkey. It was really tender and juicy, with enticing scents of lemon, garlic and rosemary. A mound of fragrant olive rice and grilled zucchini rounded off this delectable creation nicely. Local flavours abound in the ‘ikan masak assam pedas’ (RM28.90), albeit with a contemporary twist. Still you’d be hard-pressed to fault the pan-fried boneless sea bass fillet with its tantalizingly spicy sauce of ground chillies, tamarind and finely sliced bunga kantan or ginger flower. Served with steamed white rice, raw ulam vegetables of cucumber, blanched long beans and okra, and traditional sambal belacan, this delightful dish will satisfy those who prefer more Malaysianised dishes. I am not big on 'pulut hitam' but their sticky black glutinous rice (RM9.90) comes with ‘red ruby’ dices (like 'tab thim krop') crowned with a scoop of homemade coconut ice cream. Mix them up and you’d get an inherently smooth and creamy sweet porridge. Equally superb is the ‘chendolicious’ (RM9.90) – a glass of fat, green ‘chendol’ strands and melted gula melaka (palm sugar) topped with coconut ice cream. But my vote goes to the pear and cardamom pudding (RM11.90) - a lovely dense cake studded with poppy seeds and imbued with the delicate aroma of cardamoms. 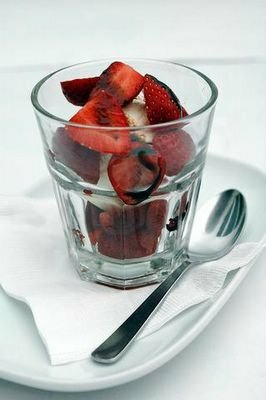 With a whole poached pear in it and some pouring cream on top, this dessert is truly to die for! Lastly, it will take much will power not to succumb to the balsamico strawberries (RM9.90), a sublime dessert of hulled strawberries and vanilla ice cream drizzled with balsamic reduction. 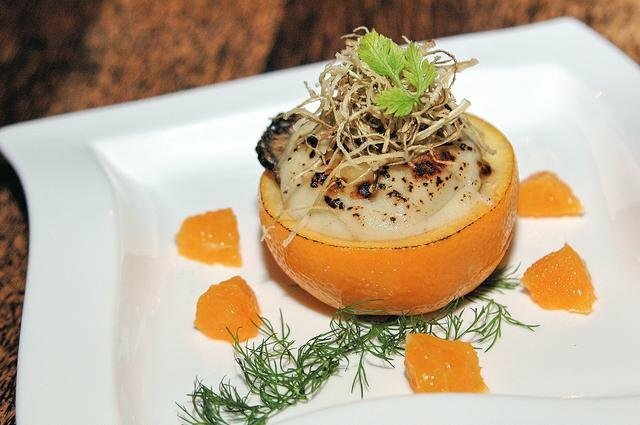 Fancy starting with Oysters Gratin in Orange Cup? Anything new is bound to have advocates and detractors. So it is with chefs and restaurants that dare venture beyond the norm. Even world renowned and highly acclaimed eateries like Nobu and The Fat Duck have their fair share of accolades and criticisms. Still it won't stop gourmands like Larry Gan from pushing the envelope with his daring restaurant ventures. After opening the trendy 'U' Japanese eatery in Bangsar, Uzen is the evolution of its sister outlet's success. For Uzen is not your run-of-the-mill Japanese restaurant so be prepared for surprising twists when you dine there. An ardent globe trotter, Gan and his wife, Caroline personally worked on Uzen’s interior design and menu concepts that remind them of their many overseas forays. There is no tatami mat in sight nor any kimono clad service staff. Instead, Uzen looks more like an ultra-cool, upmarket jazz club. The snazzy décor features raw, milled steel walls, custom-made furniture in futuristic designs, shiny, multi-layered tiled walls, and old railway sleeper tracks refurbished into sturdy dining tables. The lamp shapes are hanging works of art – some are wrought from traditional fishing baskets and bamboo fish traps banded with milled steel bands whilst others are fashioned into circular shades reminiscent of flirty frou frou skirts using squares of steel netting threaded and bound together. Even its tableware comprises specially commissioned clay pieces by Penang-based artist, Yee Kwai Hoong. The talented lass also worked closely with the Gans to execute the outlet’s edgy interior design. Its extensive menu is rather ambitious given that Uzen can only seat 70 persons. Many are classical Japanese delights with an updated twist or given fresh interpretations, inspired by innovative outlets such as Nobu and Shunju. Should you decide to dispense with the menu, leave it to the Uzen chefs to surprise you with their creations for the day. The omakase set (chef’s creations) priced between RM115 and RM175 per person gives the outlet chefs opportunity to express and surprise you with their creativity, allowing for frequent changes to the set menu using fresh, seasonal produce. 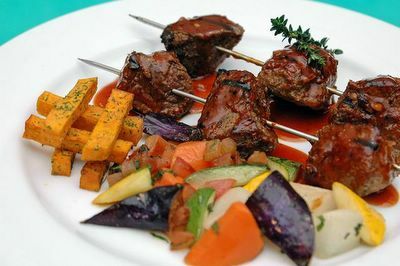 “The element of surprise is always there so you can be assured of new dishes all the time,” said Gan. Our omakase set commenced with seafood salad of sliced prawn and octopus layered between slices of lotus root, red and green peppers, and carrot. The crunchy root vegetables certainly emphasized the seafood’s freshness and delicate flavours. A simple dressing of apple vinaigrette rendered the whole ensemble refreshingly crisp and tangy. This was followed by gratin of oysters in an orange cup with gelatine and deep-fried shredded gobo (burdock root). 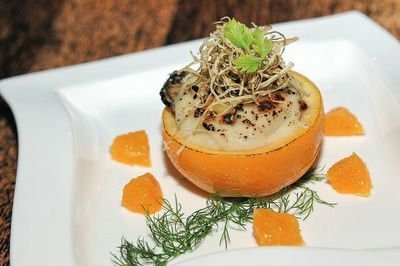 A sublime warm appetizer that would be remembered for its rich, creamy and indulgent nuances after the cold dish served earlier. The fresh sashimi – slices of raw shake (salmon), kampachi (amberjack) and shiro maguro (butterfish) – came nicely presented in a hollowed ice bowl. We had a hard time deciding which of these splendid fishes taste better. To cleanse the palate, we sipped on melon cocktail before partaking two other subsequent chef’s creations. The first comprised a piece of crisp Belgian endive filled with strips of raw tuna, salmon, squid and avocado in a mayonnaise and wasabi dressing and topped with a dollop of lumpfish roe. 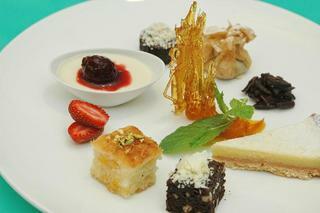 We like the clever interplay of flavours and textures. 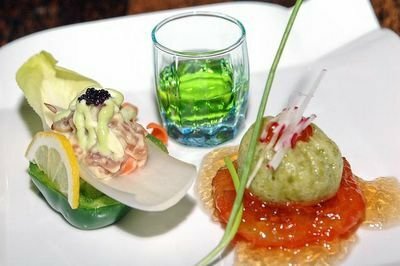 Even though I found the mashed okra with salmon roe atop a slice of tomato and gelatine a little too slimy and mushy, this creation was unconventional for its textural and taste contrasts. 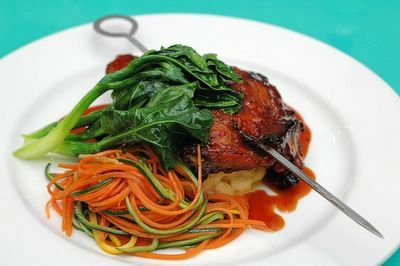 Our main course of gindara teriyaki (RM45++) with creamy mashed potato fared better. 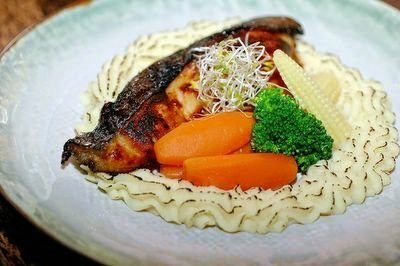 Basted with just a hint of teriyaki sauce to enhance the fish’s natural sweetness, the buttery cod was exquisite. The teppanyaki ribeye (RM42++) is simplicity at its best. Teppan-fried with butter and a dash of salt, pepper, soya and minced garlic, we enjoyed every tender, succulent mouthful. Discerning diners can request for wagyu or Kobe beef (charged at prevailing market price). Dessert ranges from macha or green tea ice cream with red bean (RM12++), dorayaki or Japanese pancake with red bean filling (RM12++) or Uzen’s cake of the day (RM10++). We had a most decadent black and white chocolate cake on the night we were there, so check on what is available for the day. Since opening, this chic outlet has quietly drawn many a corporate captain and the city’s well-heeled high society through its doors. Uzen may just be paving the way for the next generation of edgy ‘ethnic’ restaurants to open in Kuala Lumpur.